No experience necessary: Ridge Valley Riding Stables can access a variety of trail rides to please both the inexperienced rider and the advanced rider alike. We have trails available year round to ride in the sun and in the snow. Trail skill levels range from first-timer easy to more challenging and we will tailor your ride to your ability and desire. If you have never ridden before, not to worry: we will show you the basic skills to mount, walk on, turn, whoah, and dismount. Your trail guide will lead you along well-known regional trails including trails on Keith Hill, George Hill and the Upton State Forest. Rides are available seven days per week from 9 am to dark and are typically 60 to 90 minutes in length. For the novice or less experienced rider, we recommend 60 minute rides until your riding muscles are tuned up. Longer rides, more challenging trails, and a faster pace are available for groups of experienced riders. Trail selection varies to avoid wet or muddy trails and preserve trail quality for everyone who uses them. We offer rides year round — winter rides are a real treat, horses and snow are a beautiful combination. Our stable has a variety of horses to accommodate trail riders age, experience, height and weight. Our friendly and knowledgeable staff will help you select a horse that is right for you. Groups of up to 12 riders can be accommodated, it is especially simple to arrange a group ride during a weekday afternoon. Age: The minimum age for trail rides is 13 years old. If you have a group of friends, coworkers, or family visiting town, it is fun to arrange a private guided ride for just your group (no riding experience necessary). 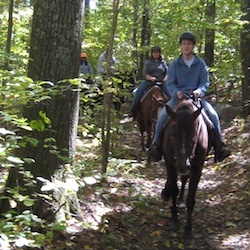 For team building at work, a trail ride together is something everyone can enjoy and share in common afterwards. Also, if your health insurance provider offers reimbursement for sports camp activities, our trail rides may qualify for a healthy activity sports camp reimbursement (see below). Please call (508) 839-3038 to reserve your ride. We are open 7 days a week during daylight hours. Walk-ins are always welcome on a space availability basis. Read the What To Wear page for clothing tips when riding. If you have been here before and have a favorite horse, it's OK to ask if that horse is available for your ride - don't be shy! Copyright ©2018 Ridge Valley Riding Stables, Inc. All Rights Reserved.